It is concept time once again and what a beauty this one is. 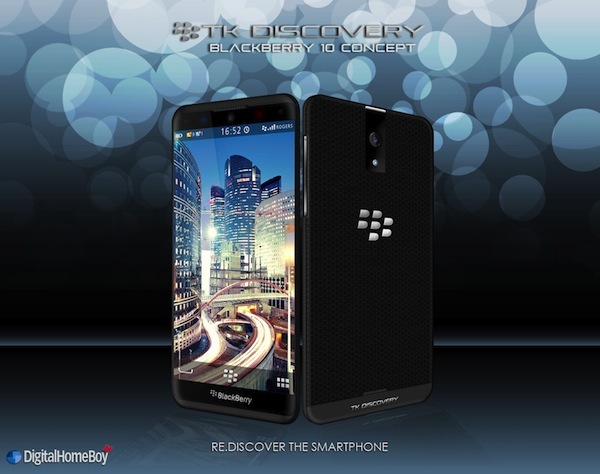 Created by DigitalHomeBoy, the TK 3.0 Discovery is clearly what he would like to see from a BlackBerry 10 all touch screen device. We have seen a couple of concepts in the past few months, one with a hardware QWERTY keyboard and another just touch, and they all look great. With BlackBerry 10 arriving shortly after the New Year (hopefully) we all now know for sure that both styles of phone will be available without too much of a gap between them, unlike RIM's original plan where BB10 was expected this year, not next. If what we end up with looks remotely like this concept I will be more than happy. I'm not sure be will see hardware with the screen all the way to the edge of the device without a bezel (on the right and left) but I'm digging what DigitalHomeBoy has done with the back of the design. The only downside to seeing concepts like this is that it makes the wait so much harder. Roll on Q1 next year. It's going to be awesome I suspect. Nice job DigitalHomeBoy. Keem them coming.